The OpenNebula Sandbox for VMware is the first of a series of Cloud Sandboxes that are being released by C12G Labs to quickly deploy an OpenNebula cloud for testing, development or integration. These will be useful when setting up pilot clouds to quickly test a new feature without having to install and configure an OpenNebula front-end. It is therefore intended for testers, early adopters, developers and also integrators. This first OpenNebula Sandbox allows the deployment of a complete VMware-based cloud infrastructure under 20 minutes. I am pleased to announce that the first book on OpenNebula, rumored a few months ago, is finally available! You can view the sample chapter and prefaces of the book, including the foreword section written by Ignacio M. Llorente and Rubén S. Montero on PacktLib (or you can download the sample chapter in PDF format). https://opennebula.org/wp-content/uploads/2018/11/opennebula_cloud_logo_white_bg-4.png 0 0 Giovanni Toraldo https://opennebula.org/wp-content/uploads/2018/11/opennebula_cloud_logo_white_bg-4.png Giovanni Toraldo2012-05-31 01:59:472012-06-18 19:45:06OpenNebula book released! C12G Labs has recently started a series of Webinars focused on different aspects and possible deployments achieved by OpenNebula. Most of these Webinars are by invitation only, but C12G will also offer Webinars open to the general public, the first one will be taking place next Thursday, 7th of June. More information about the Webinars. Last Saturday I had the chance to introduce OpenNebula at the RootCamp Berlin. RootCamp Berlin is a bar-camp in which several participants meet and agree to hold presentations on several topics of their choice. 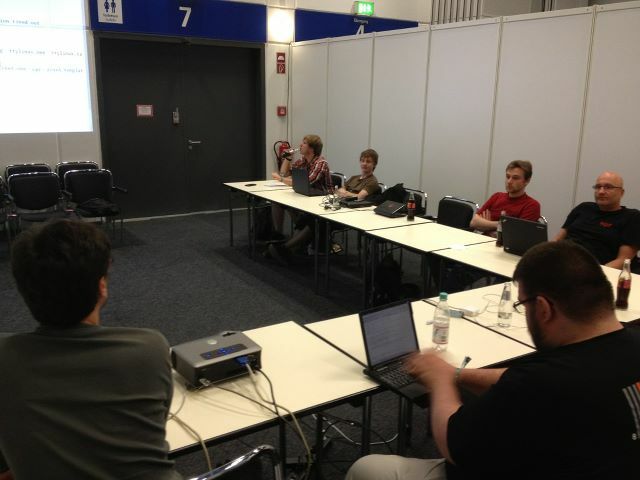 This was the first edition of the RootCamp, and it ran under the wing of the LinuxTag 2012, the leading open-source event in Europe, in which we also held an OpenNebula presentation. My choice for the hour-session was to set up a basic OpenNebula install from scratch. I used a netbook as frontend and node, and Sunstone and SelfService interfaces to perform the necessary operations. Participants of the session were able to see how to add a physical KVM host, how to upload a basic ttylinux image and how to create a Virtual Machine attached to a Virtual Network. Everything worked perfectly and we were able to SSH into the virtual machine and also to connect via VNC in Sunstone. In the meantime, I detailed and answered questions about the different possibilities OpenNebula offers regarding hypervisors, storage back-ends, network isolation modes or authentication possibilities. I finished the session setting up OpenNebula oZones, listing resources from several zones and showing how to isolate a set of resources automatically by creating a Virtual Data Center. Many thanks to all the participants of the session for their interest and to Netways for organizing the event and inviting me to join. Last wednesday OpenNebula participated the the LinuxTag conference, which is currently being held in Berlin, Germany. LinuxTag is one of the leading open source conferences in Europe and we had the chance to introduce OpenNebula to the public, explaining most of its features for cloud providers, integrators, and cloud consumers. Additionally we had a look to the current state of the project and the upcoming features. It was a great experience to participate in this edition of LinuxTag! Ignacio M. Llorente, Director of OpenNebula, will give an invited talk at the NASA Advanced Supercomputing Division – NASA Ames on the 24th of May about cloud computing architecture with OpenNebula, with special focus on cloud deployments for High Performance Computing environments. You can find bellow the slides and the abstract of the presentation. OpenNebula’s openSUSE maintainer, Robert Schweikert, has just finished upgrading the packages to the latest OpenNebula 3.4.1 version. You can download them from the openSUSE Build Service for SLES 11 SP1 & SP2, openSUSE 11.4 & 12.1 as well as openSUSE Factory. He has also contributed some KIWI examples and the openSUSE install guide has been updated to reflect the latest changes. Why Use OpenNebula on Your Existing VMware Infrastructure? VMware hypervisors of the ESX family (3.x, 4.x and 5.0) are fully, out-of-the box supported by the latest versions of OpenNebula(3.0+). If you have a server farm based on any of the ESX versions, then you can make use of OpenNebula to better manage your physical (and virtual) resources in order to build a private cloud and provide virtualized environments. OpenNebula is the most powerful open-source alternative to VMware datacenter and cloud suite, delivering enterprise-class functionality, stability and scalability with broader platform support and integration capabilities. Manage multiple storage backends. You can have multiple storage sources (datastores) serving the same host, or you can group your hosts in clusters served by different storage servers. For instance, you can have the “Fast deployment” cluster and the “Better I/O” cluster, the former served by a shared filesystem and the latter by a ssh based datastore. Scheduling policies can be adjusted per VM to better use your resources. Manage virtual networks. OpenNebula ships with network drivers that allows for an automatic management of VMware port groups. In this fashion isolated, VLAN based virtual networks can be managed through OpenNebula and operated by VMware hypervisors. Virtual Machine (VM) lifecycle management. All the states of the VMs can be manipulated from OpenNebula: submit, stop, resume, cancel, shutdown, restart. Powerful GUI. Sunstone provides a window to both your physical (ESX farm) and virtual infrastructures. VMware resources can be managed through a web browser. Hello, Linux! Complete private cloud API. Manage your physical and virtual resources through OpenNebula rich native API. Script your tasks to automate everyday operations. Access your virtual resources running on top of ESX hypervisors through public cloud APIs: Amazon EC2 (de facto standard) and OCCI (de jure standard). Offer access to their virtual resources to your end users via a neat GUI: OpenNebula Self-service. Cloudbursting. Offload your services’ peak demands to a public cloud provider. Enjoy multi-tenancy on your virtual resources. Use Virtual Data Centers (VDCs) to isolate your computing resources to be used by members of different entities. Manage multiple OpenNebula instances in a centralized dashboard: oZones GUI. Role based user management. Manage permissions of your users regarding physical and virtual resources. Fine tune permissions using Access Control Lists. External authorization modules. Use your in-house LDAP or Active Directory user base to authorize virtual resources. No need to replicate this information in OpenNebula, it will pull the information for you. Thus, OpenNebula is a good choice to manage ESX servers, and comes with many other goodies. For instance, it is compatible (simultaneously) with servers using other virtualization platforms, like for instance XEN and/or KVM. Also, you will be using a flexible platform that fits into your environment, and an open solution (so avoiding vendor lock-in), based on standards and interoperable with other private and public clouds. https://opennebula.org/wp-content/uploads/2018/11/opennebula_cloud_logo_white_bg-4.png 0 0 Tino Vazquez https://opennebula.org/wp-content/uploads/2018/11/opennebula_cloud_logo_white_bg-4.png Tino Vazquez2012-05-14 09:44:482012-05-14 09:44:48Why Use OpenNebula on Your Existing VMware Infrastructure? The OpenNebula project is in the process of creating a new Marketplace component. Users will be able to use this Marketplace to download Virtual Machine Images that will boot directly with OpenNebula. Members of the OpenNebula team will participate in the Open Source Business Conference 2012 to be held in San Francisco the 21 and 22 of May, 2012. During the week, they will also participate in several meetings in the Bay Area and give some invited talks at various organizations, like NASA Ames. Do not hesitate to contact us if you are interested in having a meeting there!